Microsoft is still trying to “upgrade” all Windows 7 and Windows 8.1 computers to their newest concoction, Windows 10. We’ve been battling that with free software (GWX Control Panel) and it’s a constant fight. Now there’s a new program (also free) to put an end to the threat of upgrade. When Microsoft started getting really aggressive about pushing Windows 10 onto computers even when people didn’t want it, they got some strong pushback. And rightly so. Some people, including myself, like Windows 7 (or even Windows 8.1) and want to keep using it. We choose NOT to go to Windows 10. So Microsoft announced that they were ever so graciously offering the option to disable operating system upgrades. This can be done on a computer-by-computer basis. All you have to do is follow their steps. Easy, right? No, not easy. The process required configuring the Windows Group Policy Editor. If you don’t know what that is, you’re in good company because most people don’t. And in some cases it also involves editing the Windows Registry – something that the average user should never attempt, as a mistake could completely mess up your computer. So Microsoft technically did offer a way to not get Windows 10, but then they made it so technical and difficult that most people couldn’t do it. It’s even been called “user-hostile”. A few months ago, an independent programmer came out with the free program GWX Control Panel, which has been better than nothing. It monitors for whenever Windows 10 tries to sneak in and alerts the user so you can swat it away again like a mosquito. But Windows 10 is a pesky and persistent mosquito so it keeps trying to get back in, and GWX CP alerts pop up, and things need to be reset. It’s a constant battle. So now we have Never10. It’s a free program, created by Steve Gibson of Gibson Research. Steve does a weekly podcast with Leo Laporte called Security Now, and he’s been in the computer security industry for decades. He’s definitely someone to trust, and he knows what he’s doing. And he also does not want Windows 10 on his computer. 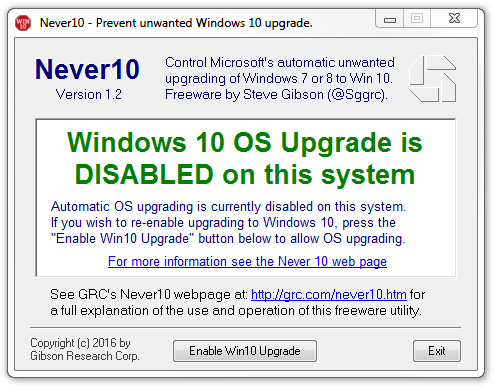 You can get Never10 here: https://www.grc.com/never10.htm (just click the green “Download now” button on that page). 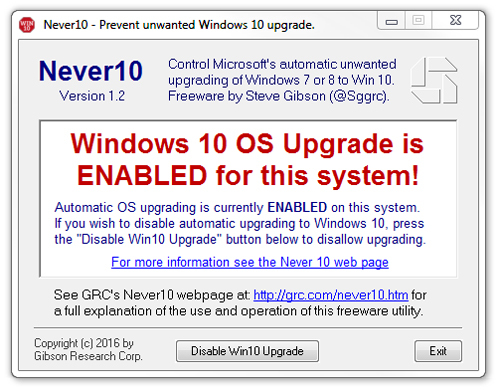 Never10 does not install anything on your computer. You just download it, and run it. You know that difficult process from Microsoft that I mentioned earlier? That’s exactly what Never10 does. It takes care of those steps for you, and it disables the Windows 10 operating system upgrade for your computer. Click “Exit” and you’re done. Of course, if Windows 10 upgrades are already disabled on your computer, you might see that second message right off the bat. Once you see the green message, you can delete Never10 or you can leave it wherever it downloaded to (it takes up almost no space). You can then also uninstall GWX Control Panel. And if your’e really geeky and want to see all the technical stuff about Never10, you can see that here. I downloaded Never10 and ran it. I deleted GWX. Now I cannot find Never10 on my machine. Running 8.1. The search finds nothing. Should the search find Never10? It’s probably in your downloads folder, or wherever downloaded files are set to be stored. It doesn’t matter if you delete it or not – it’s only 84k so it doesn’t take up any space. My friend had the update automatically downloaded, but she shuts the computer off rather than restart and has been able to keep it from installing the update. We just ran Never10 and it disabled the update and removed the files for us but it still has the “you need to restart your computer to complete the update” message and will not check for updates. Rather than restart the computer now (we are working remotely) she is going to let me know what happens when she starts it up tomorrow. I think she should be okay as Never10 removed the update files. Wanted to run it by you, though, and get your input. Thank you for all you do and the info you share. Yes, should be fine after the restart.